The H260-1 horizontal post box is our biggest selling, most commonly specified mailbox for blocks of apartments. Conforming to European Norm EN13724 and Secured by Design's Homes Guide 2016, this space-saving letterbox is the most compact format unit available in the UK which can accept a C4 envelope (A4 document sized) without the need to bend or fold it for delivery. With dimensions of 260 x 110 x 375mm (width, height, depth) and an overall capacity of just over 10.7 litres, the H260-1 is extremely well suited to high density projects including mixed-use schemes typically in city centres, and student accommodation developments alike. The space-saving, low footprint of the H260-1 allows for a larger quantity of letter boxes to be incorporated into a bank. It is not uncommon for clients to specify large banks of 200+ units; any configuration is possible. The only limit is the amount of space available on site. This generally requires that large banks be spilt into smaller, more manageable sections for ease of transport and handling, and to minimise the potential for damage. Bank sections sizes can be determined by client to find the right balance between speed of installation and ease of handling. As part of our integrated service, Post Boxes UK includes schematic drawings and packaging to ensure fast, hassle-free handling and installation on site. With it's semi modular format, the H260-1 multi-occupancy mailbox can be specified for any of the three usual installation methods: recessed-in-wall; face-fixed-to-wall; or as a freestanding stand alone bank of letterboxes with own support legs. The H260-1 is available in a choice of over 200 different RAL Classic finishes and can be specified to gloss, satin or matt finish levels, dependent upon the RAL colour chosen. 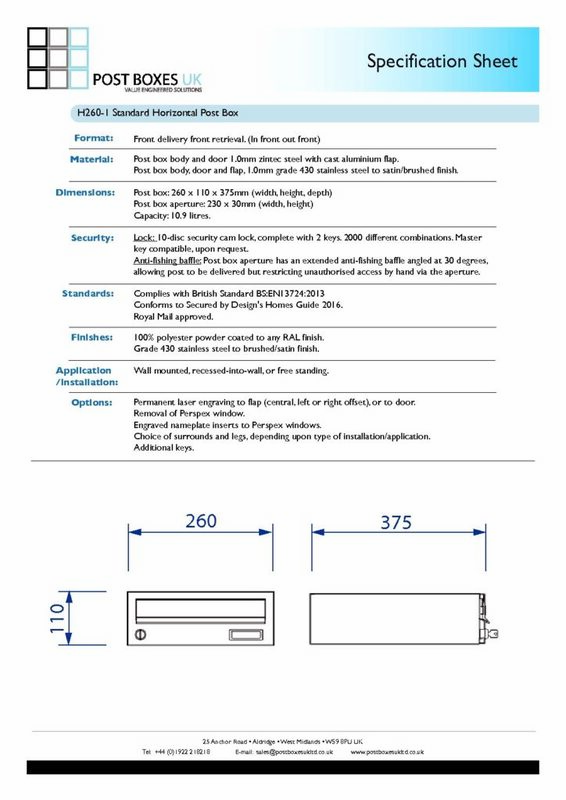 Clients may also specify Class 0 flame retardant / resist fire-spread paint to the H260-1 letter box, compliant with BS476 Parts 6 & 7, should this criteria be required to satisfy Building Control and Fire Regulations. 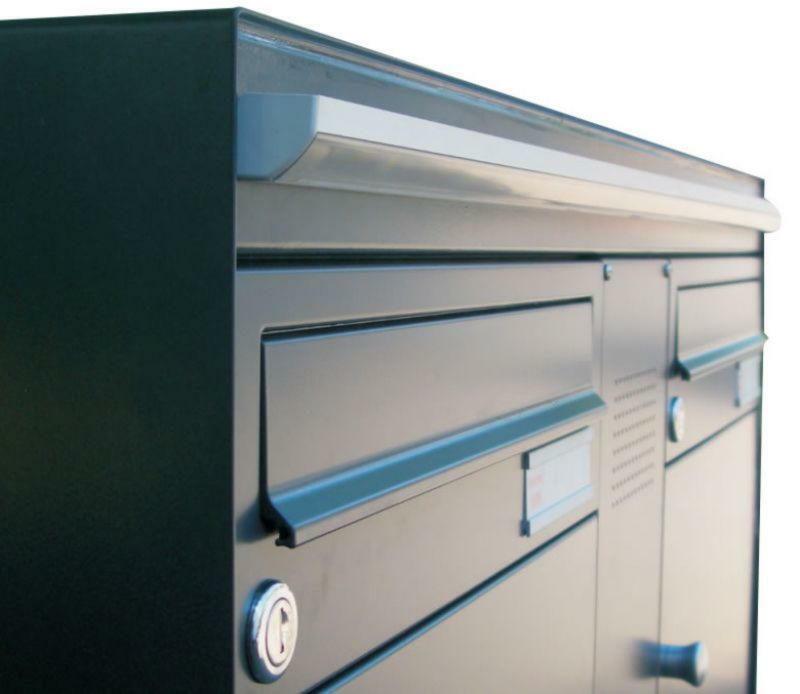 Post Boxes UK also offers the H260-1 communal post box in a range of textured, anodic and premium metallic powder coat finishes, including satin stainless steel, black chrome, gloss copper and matt velvet black to name a few. 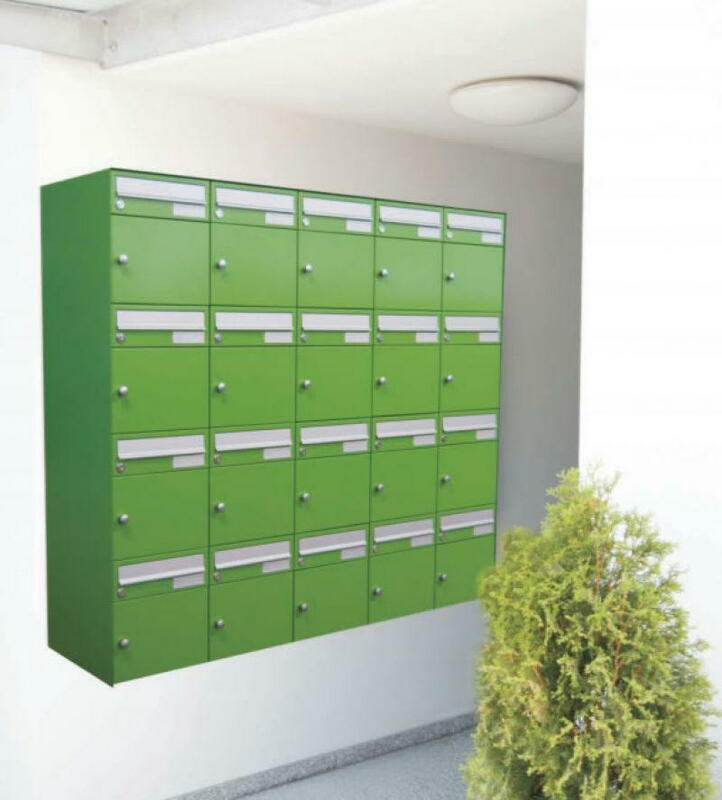 In recent years we have also offered multi-coloured banks of mailboxes, giving a more vibrant look; a particularly popular choice for student accommodation projects. Lead-times for the H260-1 are dependent upon project specifics such as specification and quantity of units required, but are generally in the region of 4 weeks for bespoke built projects. However, for more technical specifications and larger orders, Post Boxes UK suggests allowing for a little additional lead time. Please contact us for up to date information. 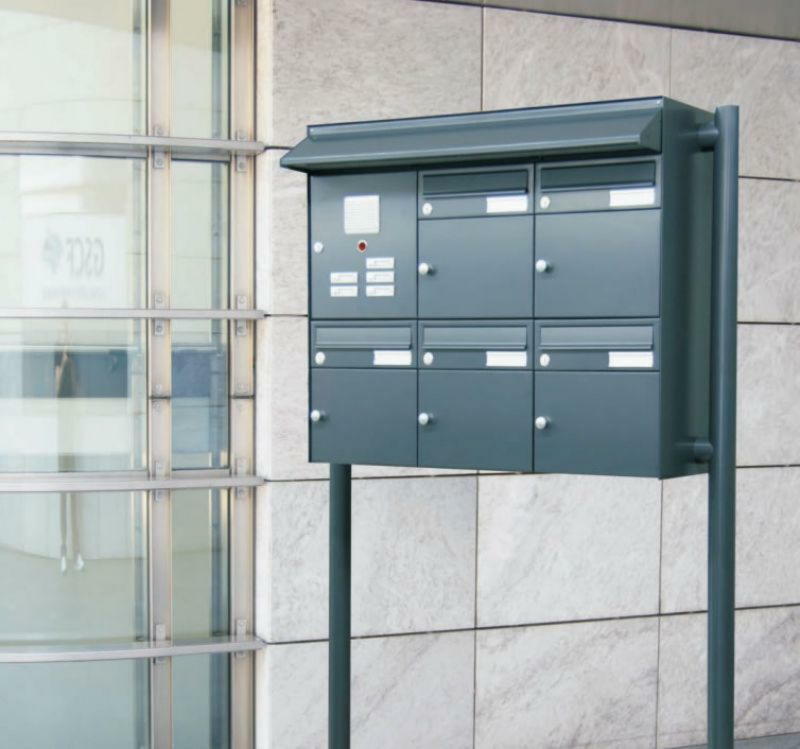 This communal mailbox is manufactured from 1mm and 1.2mm electro-galvanised steel and stainless steel, and is suitable for both internal and external locations. It's clean and contemporary design lend itself well to any internal apartment lobby or external entrance area. Accordingly, there are a number of associated finishing surrounds and trim options available for the H260-1. For recessed-in-wall letterbox banks, a choice of 20mm or 40mm, mitre cut flange surrounds are available. Where required, Post Boxes UK can also offer larger dimensions than 40mm for those wishing to create a feature of the recess trim. Also known as a picture frame profile, this surround is designed to sit flush against the wall and the front/leading edge of the bank of mailboxes, overlapping and hiding the structural opening cut into the wall. For both on-wall / wall mounted and freestanding post box banks, there is a choice of 2mm sheet finishing surround (also known as cladding), or 20mm volume finishing surround, which can give a more aesthetically pleasing visual. These surrounds not only give a uniform and integrated look to your bank of letterboxes, but also afford enhanced weather resistance for external mailboxes. Freestanding banks of H260-1 post boxes are available with a choice of different support legs: pedestal legs which sit directly underneath the bank of post boxes or side support legs which attach to the left hand and right hand sides of the bank. For wider banks, a combinations of side support legs and pedestal legs can be specified. To conform with European Norm EN13724 the maximum recommended height for a bank of mailboxes is 1800mm FFL (from finished floor level) and so Post BoxesUK manufactures support legs to any client specified height. The H260-1 post box can be specified with or without apartment numbering / identification. Numbering options include engraved nameplate inserts which can be placed into the perspex window on the door of the mailbox, or laser etched / engraved numbers onto the letter flap or door of the box. With laser etching, most Microsoft Windows fonts can be specified, as can the position of the characters on the letter flap with a choice of central, left hand or right hand side. Laser etching can also be done on the door itself with the usual position being the lower right hand corner of the door, by way of de-specifying and removal of the perspex window to give a more contemporary look and feel. As standard, the H260-1 multi unit mailbox comes with a high quality Eurolock cam lock (non-mastered). Whilst this usually satisfies the requirements of most projects, others will require a more comprehensive security solution for their postal box system. Post Boxes UK therefore offers a range of different suited solutions, including but not limited to 500 / 2000 / 10000 / 5 million differ cam locks, master keyed suites (UMK), combination locks, padlock compatible cam locks, push button digi-locks, RFID / NFC proximity locks, and Salto compatible locks. With such a vast array of locking options, we encourage clients to contact us to discuss specific projects requirements wherever possible. 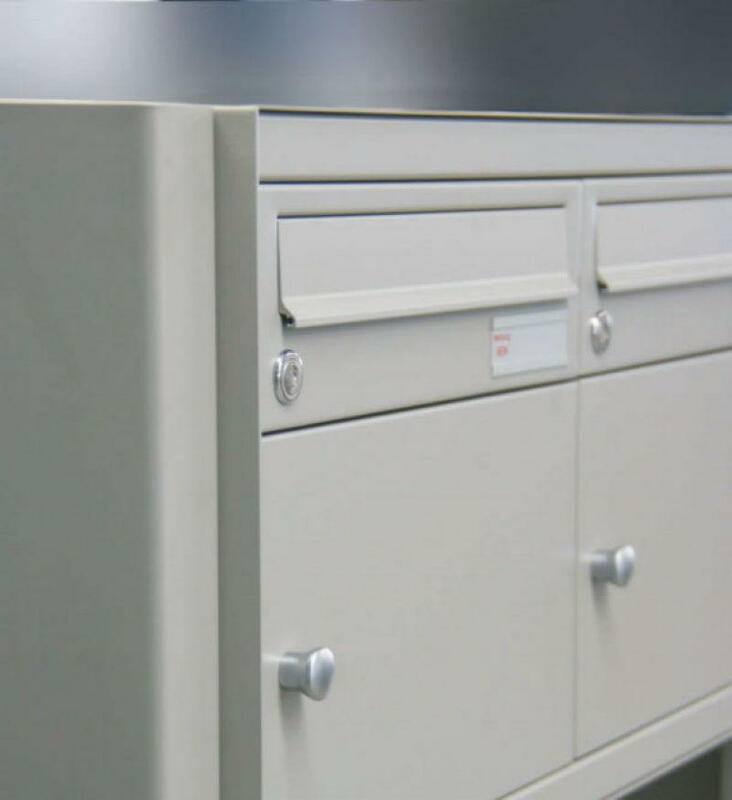 Post Boxes UK also offers replacement keys for its model H260-1 secure letter box, dealing with on-site reception and management teams, developers and block management companies. We also offer discounted rates for bulk replacement key requirements, and replacement lock programmes for clients wishing to upgrade from their current lock system. 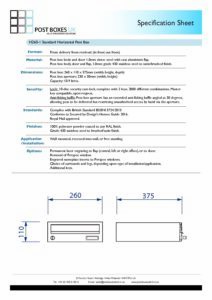 The H260-1 apartment mailbox complies fully with Secured by Design's Homes Guide 2016 (the most current version), which requires that the box conform to EN13724, be of robust construction and have an anti-fishing device. With a steeper and longer withdrawal plate to it's inner aperture than similar/equivalent models of competitors units, the H260-1 allows for a C4 envelope to be deposited easily but also keeps it safe and secure from unauthorised attempts of fishing via the aperture. Being of a semi-modular design and construction, the H260-1 mailbox is the low profile 110mm high version in the H260 range. Other units include the double height 220mm and triple height 330mm high capacity mailboxes. These high capacity units lend themselves well to communal office reception environments which house postal delivery points for commercial and bulk mail receivers.